of the Illinois Central railroad, for which he has been district attorney for a number of years, and takes up his new duties at once with headquarters at Chicago. His promotion is indeed a deserved one, and earned by his fidelity to the duties of his profession. In that his friends indeed rejoice. him the sincere good wishes of all to his new field of labor. 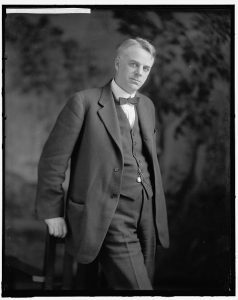 Picture of Louis Fiene from the Library of Congress. 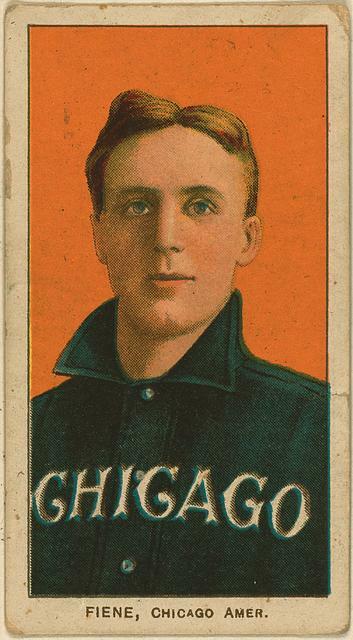 Source: Baseball cards from the Benjamin K. Edwards Collection. Issued by the American Tobacco Company. It is proverbial that those belonging to sporting circles are good spenders that they make their money easily and get rid of it easily. However, this does not seem to to be true of Fort Dodge men. Frank Gotch, the world’s champion wrestler, salted his money in real estate and has become independently wealthy and now it seems that Louis Fiene, one of the crack pitchers of the Chicago White Sox and a former Fort Dodge boy will follow his good example. Fiene has returned home with over $2,000 (about $53,208 today), his share of the winnings of the team and a salary saved for this year’s work and with this and previous earning will buy a farm in Oklahoma and move his mother and sister to that place. Fiene’s rise in the baseball world has been phenomenal. Starting three years ago with the independent Fort Dodge team the work of this boy wonder, for he was then only nineteen years of age, won him a place for 1904 with Cedar Rapids of the Three I League and the following year he did great work with Detroit. Although laid up most of the past season with a game arm, what work he did was great. His pitching in the last series with Cleveland when he allowed only four hits has become historic. 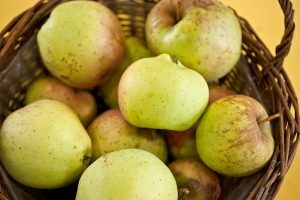 Webster City Oct. 22 — Mrs. Prudence Bishop of this city has received a box of beautiful Bellflower apples from her brother, of Streator, Ill., who picked them from a tree which she planted seventy-two years ago. Mrs. Bishop is now eighty-eight years old and probably not another woman or man in Iowa enjoys the unique distinction of eating the fruit from her own vine and fig tree almost three-quarters of a century after planting. Yellow Belleflower apples. Photo by Sven Teschke. This file is licensed under the Creative Commons Attribution-Share Alike 3.0 Germany license. Touches of Tragedy and Chunks of Comedy to the Passing Play on the World’s Great Stage of Human Action. The Players’ Entrances and Exits. A Faithful Reproduction of Seven Days’ Scenes And Incidents in Local Life in Which We all Are Actors. The “Midway Plaisance,” the name under which the social at the armory was given last Wednesday evening, was by no means a misnomer, for the hall was decorated, adorned and populated as one who had never seen the original Midway would imagine it might look. Booths attended by charming maidens adorned in various oriental costumes were scattered about over the large hall and the wares they handled went like red lemonade at a circus. The novelty of the name was the means of drawing a large crowd, and the result was a neat sum secured to the society, for whose benefit it was given. A man who had been fleecing the counties of Kussuth (sic) and Humboldt with wolf skins, claimed to have been killed in these counties, and who had already worked Webster county for $35 in the same manner, was arrested here Wednesday while trying to work Auditor Cunningham for bounty on three more skins. He was taken to Kossuth county for prosecution. Judge Hyatt granted an injunction this week restraining the county auditor from entering Rosanna Arnold’s property upon the tax book for guttering and curbing assessments. The description is lots 7 and 9 block 16 and the amount assessed was $441.00 (about $11,734 today). The property owner claims damage to the property by the grading that was done. The Swedish Grieg Mandskor went to Badger last Tuesday to give one of their musical entertainments there for the benefit of the Norwegian Lutheran church. This organization is a very strong one, the chorus consisting of nearly twenty voices. The committee on bridges let the contract last Tuesday for repairing the Lehigh bridge. Bids were as follows: J. Daniels & Co., $380; O.H. Larson, $447; C.T. Gustafson, $565; J.T. O’Connor, $595. The contract was given to Daniels & Co., who reside at Lehigh. It appears that the prohibitionists of Webster county have reconsidered their endorsement of C.W. Newton for county treasurer and placed upon their ticket Mr. D.K. Lincoln instead. This is the way the ticket is filed with the county auditor. The university of Iowa foot ball team got beautifully wallopped (sic) by the Denver atheletic (sic) club team in Denver last Saturday. The score stood 58 to 0. Should think the boys would be ashamed to come home. Mrs. Jacob Mericle, of Holiday creek, one of Webster County’s pioneer settlers, died at her home last Wednesday, aged 72 years. She leaves a husband and a large family of children to mourn her loss. A man in Meadville, Pa., has invented a barometer which not only indicates the weather in advance, but will sound a continuous alarm before the approach of cyclones and other death dealing storms. The ladies of the Presbyterian church gave a most enjoyable social at the Armory last Friday evening. A large crowd was highly entertained by the very excellent musical program provided by the ladies. John Koll has broken ground for a two story brick building, 22×30, on First avenue south, adjoining O.M. Oleson’s warehouse. Mr. Oleson will begin in a few days to veneer his with brick. M.F. Byrne and Miss Kate McClarney were married at the home of the bride’s mother in this city Wednesday morning. The young couple left for Chicago on a wedding trip. Four new recruits for the U.S. army have been secured in this city, as follows: S.A. Brown, Will H. Brown, Robert Curliss and Roscoe King. They all enlist for three years. The vault door of the American Express company was closed a couple days this week, because the combination would not work. It had to be drilled open. A. W. Braley has resigned his position with the Mason City Times and was spending a few days calling upon Fort Dodge friends the first of the week. The annual meeting and banquet of the Plymouth Clay Products Company will take place Tuesday evening. The traveling men and stockholders are arriving in the city today, and all will be here for tomorrow. Lou Brunenkant has resigned his position with the Strow Cigar Company and has taken one with Robert Wilson at the Conway Cigar Store. Brunenkant worked in his present position when the Conway Company had the place. Mrs. J.M. Spayde has resigned her position at the Cozy Tea Rooms and accepted one at the Drapery Shop. Mr. and Mrs. A.S.R. Reynolds leave the last of the week for California where they will spend the winter. The fire department were called about 2:00 p.m. today to the home of F.P. Schultz, 1504 Fifth avenue north. Whent he department arrived a small fire was discovered in the basement of the house. It is thought some rubbish which was piled near the furnace caught fire from the furnace causing the people to call the fire department. The fire was easily extinguished and practically no damage was done. A home on First avenue north was entered precipitately Saturday evening about 9:30 by Miss Sarah Gallagher, who was badly frightened by a recent encounter with a purse snatcher. She explained that she had been walking between Central avenue and First avenue north when a man ran paster her and snatched at her purse. The purse handle broke, the purse fell to the ground and the man did not turn back to get it, but disappeared down an alley, running west. Miss Gallagher recovered her purse, which she said contained about fifty dollars (about $1,135 today).